Can virtually blowing up things that upset you be considered slightly satisfying or therapeutic? 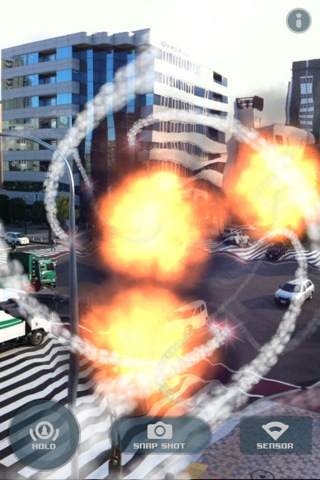 While you ponder that thought check out AR Missle – an augmented reality shooter iPhone game from PSOFT that lets you virtually shoot rockets at real objects in front of your iPhone camera. The app is pretty simple to use. Once you open it up, it shows you a live view from the back iPhone camera lense. Tap anywhere on the iPhone screen to place a virtual target, and watch as a missle is launched that wraps around and blasts away your intended target. The missle makes a neat sound effect and when it blows up, a virtual ripple effect adds to the explosion graphics and sound to make the AR experince complete. For added value, you can keep a finger on the “hold” button and place multiple targets with anther finger. Then when you let go the hold button, all missiles launch at the same time. Touch the sensor button, and AR Missle makes the live view into a heat sensor effect, that looks like something out of the Predator movie. 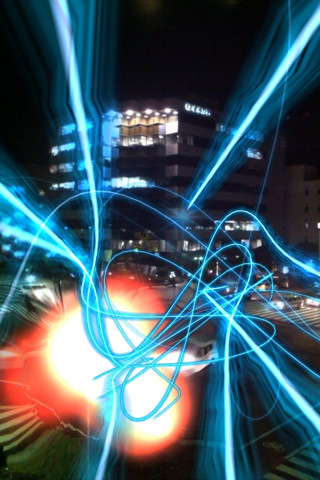 If you really love what this app does, you can tap a button to snap a photo of the action anytime. Tap and drag the “Time Shift” slider to pick the exact frame of the recorded action. Then the app lets you either save the photo, or post it to your Twitter account. There isn’t much to the app, but its pretty original, fun to play, and showing it off to your buddies might get a few oohs and awes as well. The updated version of AR Missile now includes a laser missile that you can switch to, as opposed to the basic rocket. They have also added a vibration option. AppSafari review of AR Missile – Automatic Target Tracking was written by Joe Seifi on December 24th, 2010 and categorized under App Store, Augmented Reality, Fun, Games. Page viewed 5798 times, 3 so far today. Need help on using these apps? Please read the Help Page.